Families of some injured victims of the Kintampo gory accident has revealed they are made to pay their own medical bills even though government had promised to foot the bills.. In an interview on PEACE NEWS, a family member of one of the victims, Madam Gifty Quartey said they had to take loans and money from elsewhere to foot the medical bills of their relatives who were involved in the accident even after government had promised to underwrite the bills. "We had to look for loans to be able to pay the bills of our brother before the doctors will attend to him," she said in a distressed tone. However, speaking on the same issue, the Techiman North District Chief Executive, Mr Peter Mensah said government is committed to paying the bills of injured victims and compensating families who also lost their relatives. He called on families who have in any way paid bills at a hospital to bring their receipts for government to repay. "Government is still committed to paying the bills of injurd persons. I urge all families to be patient as we will follow up to the hospitals and make sure all bills are paid for," he said. 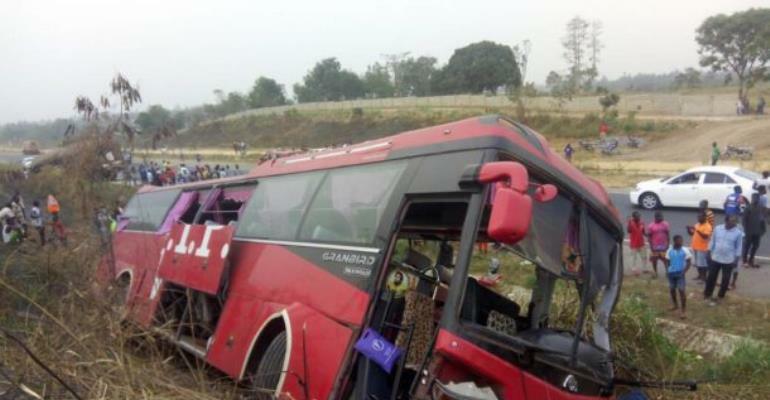 On Friday, March 22, 2019, there was a deadly accident on the Techiman-Kintampo highway, when two buses– a Grandbird with registration number GT 5694-18 traveling from Garu to Kumasi and a VIP bus with registration number GT 3916-17 also traveling from Accra to Bolgatanga collided head-on. About 55 persons were confirmed dead, and 30 injured. A total of 35 out of the 55 who died were burnt beyond recognition.